The Grill2Go is yet another one of those grills whose manufacturer is trying to persuade you to part with your money, because it delivers top quality results, and can be transported easily. Buyers are skeptical of these types of claim, so I thought I’d investigate further. Is the Char-Broil TRU Infrared Portable Grill2Go Gas Grill really capable of an exceptional standard of cooking? Is it super-portable? You can find the answers to these questions and others here. The whole unit is incredibly secure, has a locking lid, and is mounted upon a high-impact frame. It actually looks like a toolbox, and I’m sure buyers browsing the internet, have mistaken it for one, many times before, although I’d consider this as a terrific portability feature. Grills that are moved about regularly tend to suffer the wear and tear of travel and often become damaged, but the Grill2Go is guaranteed, with this kind of frame, to remain in perfect condition, no matter how much it’s bumped about. There’s a small footprint too, along with a low weight of 26 pounds, so it’s super-portable, so much so, that I found myself wishing they’d gone the extra mile and included legs that fold, for even easier storage. The measurements are 23.7 inches of length, by 15 inches of width, and its height is 13.6 inches, which means you’ll need something to mount it on, but that’s common with super-portable grills. When manufacturers need to cut costs to sell at a low price, often the grates are the first to go. You’ll find that generally cast-iron grates are the best, whereas steel grates perform alright, but at a much lower quality standard, in terms of evenness and speed. Steel is cheaper to produce, so you’ll find on low-cost super-portables like the Grill2Go, and a great many others, steel is often chosen. What they do to compensate for this decision to use steel, determines the overall quality of the grill. The most common solution is to add more power, so more BTU’s an hour, and this usually works pretty well, but doesn’t have amazing results. We can call this the muscle solution, whereas Infrared Technology goes in the opposite direction; that of intelligent design. Char-Broil chose to slot in the Infrared, just for you. I’m going to give you a brief tour into Infrared and what it does, so you understand exactly what’s being offered here. The traditional convection cooking you find on most grills, uses air-flow to heat up food, whereas Infrared limits the flow of air into the cooking area, and in this oxygen-free environment, it can create exceptionally high temperatures. Food is cooked quicker than with convection grills, and on top of this, Infrared Technology disperses heat outwardly in an efficient way, so that evenly cooked meats are guaranteed. Until recently it was priced too high to be included on a grill in this affordable range, but times change, and advances are made, so we’re beginning to see its inclusion more and more. On the Grill2Go Infrared does the job of top quality cast-iron grates, meaning there’s none of the unevenness, you’d still get with ‘the muscle solution’. Thus the Grill2Go offers a supreme standard of cooking, that is super-fast, because of all that heat built-up by the Infrared beneath the grates. Infrared will not erode the natural moisture barrier in foods, so meats won’t be dry, and in this way, it also provides a solution to some buyers critiques of high-powered gas grills, that they dry out food. There’s a great amount of space on the Grill2Go as well; Char-Broil has provided 200 square inches of room, with one burner distributing 9500 BTU’s an hour. If you’re thinking that’s too few BTU’s to heat up quickly a 200 square inch cooking surface, it usually is, but not on an infrared grill. 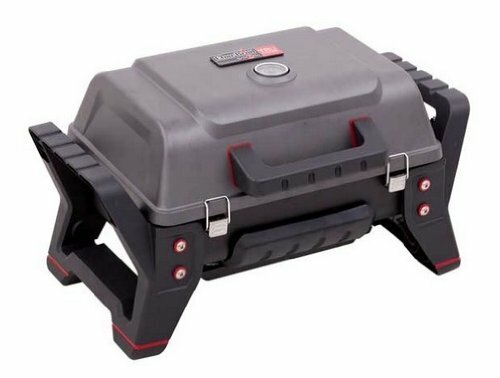 One thing buyers should be aware of is that the Grill2Go only takes a 20-pound gas tank, and you must buy it separately, so be careful to check the size of the tank you’re buying. Very few grills these days come with a gas tank, so this is quite normal, although hopefully, this will change in the future. The Grill2Go comes with a very accurate built-in temperature gauge and a quick start ignition, so you can get going immediately after setting it down. It isn’t very pretty to look at, but good looks won’t fill your stomach on a cold night camping in the woods. The Grill2Go more than makes up for this with some excellent infrared technology, for terrific even and fast cooking. It’s also very secure, so won’t be damaged during transportation, and its lightweight frame guarantees a stress-free pickup and go option. For the price, 200 square inches of cooking space is also excellent. The Verdict: Worth a purchase for campers and tailgaters. And one of the best portable gas grills.